Nothing divides and unites Italians like pizza. 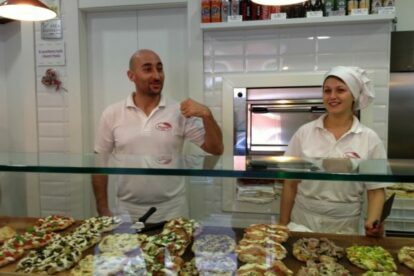 We all love it, but ask us to choose between low crust (Roman style) or high crust (Naples style) and you’ll get very different and passionate answers. But there’s a new player in town: pinsa. The difference between pinsa and pizza is in the dough: pinsa is in my opinion lighter and easier to digest and normally it’s more toasted. It’s usually served in an oval shape and you can find it only in Rome, since it was invented nearby by the farmers long ago. Pinsere is one of the best examples though of why pinsa should be all over the world. Here you can get single serving pinsa cooked at the moment all characterized by interesting ingredients: I love the “Gricia”, made to resemble the pasta dish from where it gets its name, or the one with bacon, provola and pumpkin sauce. The place is usually packed with both tourists and office workers nearby, but the service is fast and kind and it always cracks me up hearing the staff talk English, because they’re not bad at it but it will be the most Roman-English accent you will ever hear. And remember that there is good pizza everywhere, but not good pinsa.